For lunch in main line today we are having roast pork and mashed potatoes. The Sadie Hawkins Dance is coming up on April 27. This is a girls’ choice dance. So girls, get your dates. 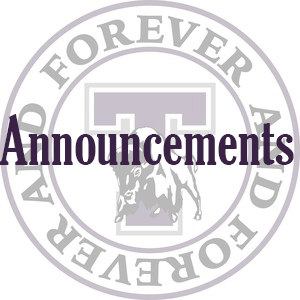 Attention Tooele High! Spring Fling is coming up on May 3 and you know what that means-Volleyball. This year our annual tournament is opened up to anyone that wants to play. So get together a team of 6-8 people and sign up in room 206 before Friday the 26th. Seniors, the A.L. England Business scholarship, A.L. England Music Scholarship and the Milne scholarship are all due April 23rd. These scholarships total $2,500 and they are only for Tooele High seniors. Please see Mrs. Dangerfield for more information. Have you tried the cool slushies in the Buff Stop yet? Now is your chance. There is a great Slushy Meal Deal now. A slushy, bag of chips, fruit snacks, and bag of cookies all for 3 dollars. Saturday, May 4 will be Saturday School. It is from 8 to noon. Students will help clean up our school and in doing so, can clear 4 UAs. The cost is $10. Sign up by paying $10 in the finance office. Students, do you want to travel? Do you want to work in The Buff Stop? Do you want to learn some Business Skills? Do you want to be in DECA and FBLA? Enroll in a business class for next year. Talk to a business teacher or your counselor now to be in a business class next year. Tonight is Parent Teacher Conference here at THS from 4-7. All students interested in running for a class officer for next year, information packets are available in room 206. They will be available until Thursday. There is also a mandatory meeting on Wednesday, April 24 at 7:15am. If you have any questions, please see Mr. Valdez or Mrs. Beer. Students if you are interested in lifeguarding at the Energy Solutions Aquatic Center this summer, go to the Tooele County website to apply. There will be a basketball shooting clinic held on April 26 & 27 here at THS. It will cost $25 and you can sign up in the financial office, spots are limited so it is on a first come first serve basis. SIGN UP TODAY! Boys basketball players that are planning on attending any summer camps for THS need to sign up with Coach Thomas in room#123 any time before or after school and pay the financial office. On Saturday May 11th, Tooele High Latinos in Action is sponsoring a 5 on 5 soccer tournament here at THS. Get your teams together and start practicing. Prizes, Medals, and Bragging rights for the winning team. Sign-up online or the day of the tournament. $50/team. 2 games guaranteed. Activity Enrichments are due to Mrs. Goss by April 26th. Forms are available in the counseling & the main offices. Good Luck to Baseball @ Stansbury. These are your announcements for today, thank you, HAVE A GREAT Day and GO BUFFS!